The real estate sector can be divided into two segments-construction (real estate asset classes, infrastructure) and real estate services (consulting, broking, facilities management, among others). The Indian real estate industry has attracted significant investment over the past few years owing to rapid urbanisation, positive demographics and rising income levels. Apart from metros and tier-I cities, there is fast growth in the real estate sector accounting to tier-II and III towns. According to an India Brand Equity Foundation study, the country’s real estate market size is expected to touch US$ 180 billion by 2020. The housing sector alone contributes 5-6 per cent to the country's gross domestic product (GDP). Also, in the period FY08-20, the market size of this sector is expected to increase at a compound annual growth rate (CAGR) of 11.2 per cent. Real estate has emerged as the second most active sector, raising US$ 1.2 billion from private equity (PE) investors in the last 10 months. 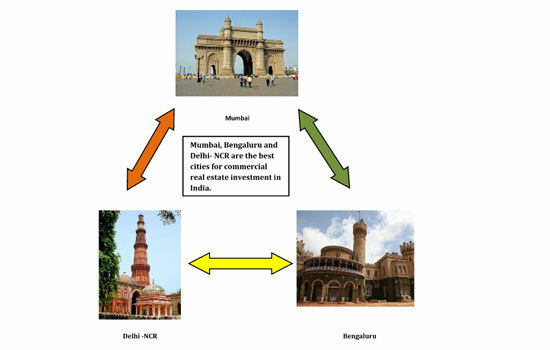 A study by Knight Frank found Mumbai as the best city in India for commercial real estate investment, with returns of 12-19 per cent likely in the next five years, followed by Bengaluru and Delhi-National Capital Region (NCR). “The growing population, the overall economic growth of the country, rising income levels and increased foreign investment have led to a heightened need for improved infrastructure across urban, semi-urban and rural India. This has also led to a natural increase in demand for residential and commercial real estate across the country,” comments Rohan Bulchandani, Co-Founder & President, Real Estate Management Institute (REMI) and The Annet Group. Various recent government initiatives like 100 Smart Cities Mission, plans to have housing for every family by 2020 and relaxed FDI policy for real estate sector have come as a shot in the arm for the real estate market and offered ample opportunities to the people in the trade. The centre government has now announced the name list of 98 cities to be developed as ‘Smart Cities’ and there is good mood among the realty players. 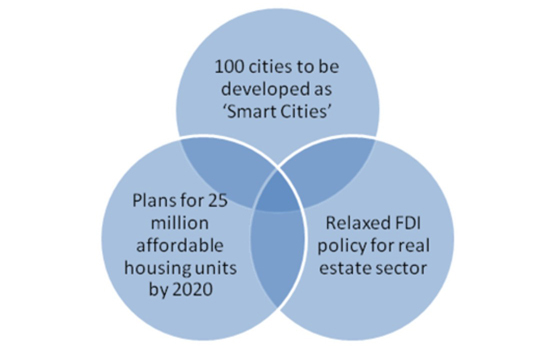 “I feel that creation of 100 smart cities will bring in ample opportunities to the real estate market. This initiative will help the government and the developers to come together and work towards the infrastructural development and thus offer a better standard of living. Having a positive impact on the sector as a whole, we can expect a lot of projects coming in the market. With the quality of infrastructural developments that are expected in these smart cities, I feel that it will be a big attraction for HNI’s and professionals to settle down here. This will in return boost the demand of new apartments in these areas,” shares Chopra. How franchising works in Realty? 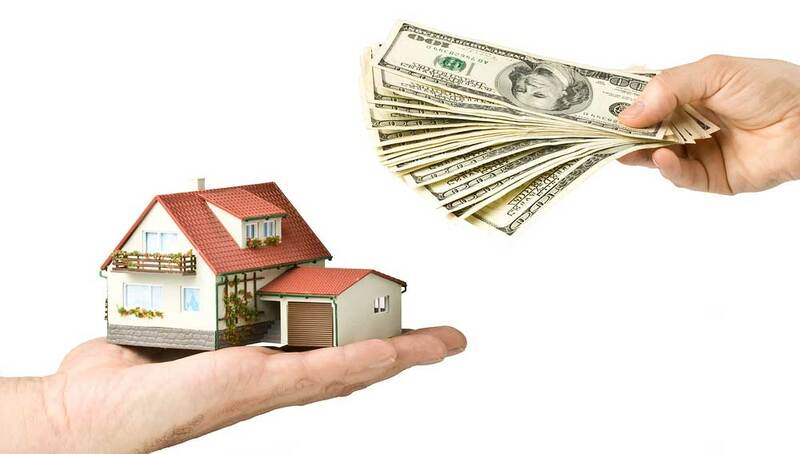 A few Indian and international players in the real estate sector are banking on the franchise route & reaping returns. “There is tremendous business opportunity in the field of real estate and with India now becoming a hub of franchisees, a lot of old and established players are expanding their footprints , looking for like-minded people who want to take their business to the next league. Franchising in this sector is shifting towards the paradigm of getting more regulated, organised and professional and so have the business practices evolved to match up to this growth. Getting a franchise like RE/MAX into the Indian market would be helpful in taking the Indian real estate to a level in which it operates in developed countries. With franchising, we aim at providing a local, regional, national and global network, world-class training, advanced technology platform, power of collective marketing and a host of support services that help our franchise owners and business associates in taking their real estate business to a next level,” Chopra tells Franchise India. The brand, which presently runs 100 plus offices in 30 + cities across the country, is looking at opening 500 offices with 5000 associates. Another major player Coldwell Banker, which is one of the oldest residential real estate franchise systems of North America, is looking at opening its 100 franchises in India in the next three years. The company has a footprint in about 49 countries with over 3100 offices worldwide. While, REMI currently has two centers in Mumbai located at Mahalaxmi and Thane and looks forward to growing the brand to 50 centres training 50,000 students over the next five years. “We look to adopt an owned and franchise model, with the aim of 19 owned and 31 franchise centers by 2020. We are looking to expand to Pune, Bangalore, NCR, Hyderabad, Ahmedabad, Chennai, Kolkata, Jaipur and Lucknow after Mumbai,” Bulchandani adds. Brickwood To Expand Via Franchise..
Why Airport Retail is Turning Hot This Season.. Global Eco-friendly Brands Bet Big in India..